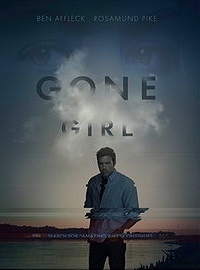 'Gone Girl' is a 2014 mystery thriller staring Ben Affleck, Rosamund Pike and Neil Patrick Harris. When Nick Dunne (Affleck) returns home from the pub on his fifth wedding anniversary expecting a night in with his wife, he is shocked to find their lounge room ran-sacked and his wife Amy Dunne (Pike) nowhere to be found. Assuming she is missing he contacts the police, who search the home and find suspicions evidence pointing to him. As the story continues we see flashbacks into Nick and Amy's marriage where things weren't always good. Both had lost their jobs during the recession resulting in money issues and we saw scenes of domestic violence which made Nick look very incriminating. Directed by David Fincher and written by Gillian Flynn. Every year for there wedding anniversary Amy creates a treasure hunt with rhyming clues for Nick to find, but this year the police get involved. Together Nick and the police hope by decoding the clues they can find Amy or at least find out what happened to her. Is Amy still live? Did Nick Dunne kill his wife or was she kidnapped? These are the questions viewers will be asking themselves throughout this film, which leaves you guesting till the very end.